Defining their sound as, “eclectic folk with a celtic flair”, Kindred has become a valued part of the Western New York music scene and beyond since first teaming in 1992. A husband and wife duo, David and Felicia Meyer bring distinct talents to their Kindred performances in the form of David’s classically trained cello flawlessly embracing Felicia’s angelic vocal stylings. Their CD, Celtic Flair, is a collection of 12 original songs, fiddle tunes, and classic Celtic standards that allows for the true Kindred experience as enjoyed in the many churches, concert halls, festivals and Irish pubs where they regularly perform. With musical passion in their hearts and a wee bit of a twinkle in their Irish eyes, David and Felicia’s performances always include a healthy dose of humor, especially when performing their audience favorite, “Half a Hundred Nuns” based on a true story involving….well….50 nuns! The Kindred tune featured in this SOB video is titled, Pleasures of Home, an Irish folk tune written at the turn of the 20th Century. 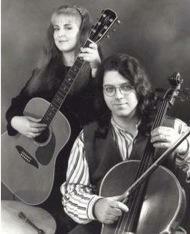 For more information about Kindred, their concert schedule and their Celtic Flair CD, check out their website, http://www.4kindred.com/.